St Hugh’s is able to provide undergraduate accommodation on site for every year a student wants to live in College. Buildings are spaced out over a wonderfully green 14.5-acre site. They all have kitchen access, which is great for when you are too busy to make dinner in hall. All this combines to create a collegiate atmosphere which few others can lay claim to. First years often become great friends with second years (and everyone else! ), and third years can be supported by younger years while they go through the stresses of finals whilst fourth years, in their elder status, have an opportunity to pass down wisdom. Not only this, but St Hugh’s has remained true to its founding philosophy of inclusion for all regardless of background. Accommodation for undergraduates is non-tiered in the college, meaning that everyone pays the same amount of money for their room. As a consequence, no one should be restricted from living with friends for financial reasons. Written by Tom Gibson - Vice-President of St Hugh's JCR. Thanks go to Leon Heng for taking many of the photographs featured on this page. 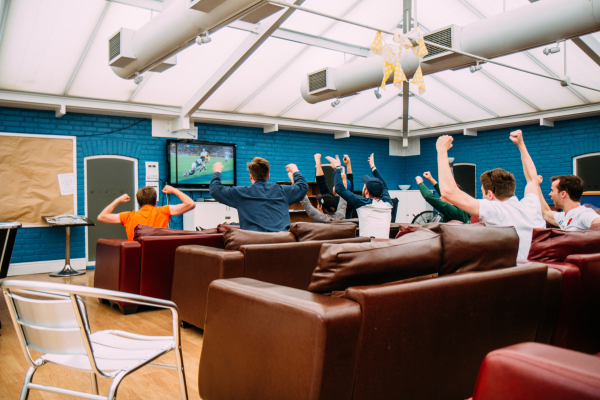 The Junior Common Room is not just like a mini student union as was said before. 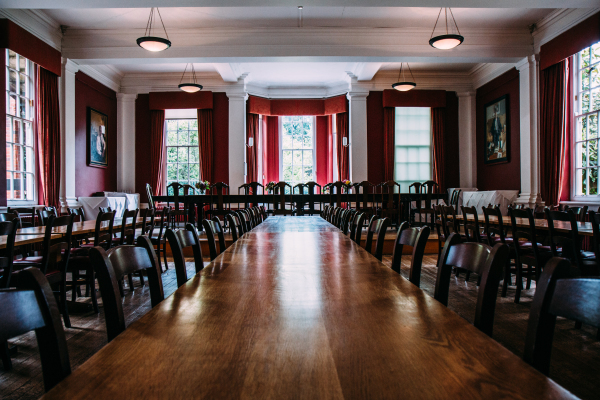 The JCR is also a room in college where students go to relax. Currently, our JCR is in a conservatory which makes it nice and toasty during the summer. But fear not during the winter; we have a heating system. 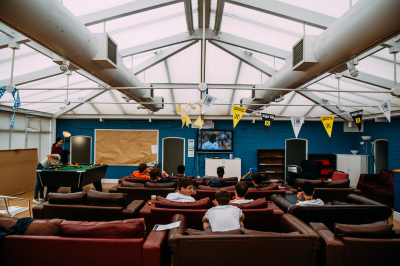 Features of the JCR include a TV with BT sport and Sky Sports, a free to use pool table, a Playstation 4 and many delightfully attractive sofas. As you can see to the left, sports events tend to get a decent attendance to creates a nice atmosphere. With the bar open just below the JCR during the evenings, evening sports fixtures are certainly popular. Other events that take place in the JCR include welfare teas, film nights and of course, the famous JCR meetings. Each college features a dining hall in which various treats are served. At St Hugh's, we are lucky to have pretty impressive food served to us on a daily basis. Hall is open for three meals a day during the week, while it runs a brunch service over the weekends. This means there is the option to have food cooked for you - and that means no washing up... But then there is the possibility to cook for yourself too, with all accommodation blocks having a kitchen installed. You can get a hot meal in hall for around £3, while you can get a hot breakfast for around £2. The other thing to know is that each week there is a formal sit down meal that costs around £9. 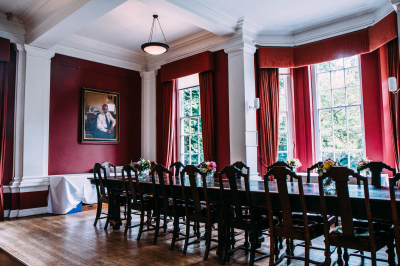 Formal is a three course meal that is seen as one of the great social settings for students during their time in Oxford. Libraries at Oxford are pretty impressive. 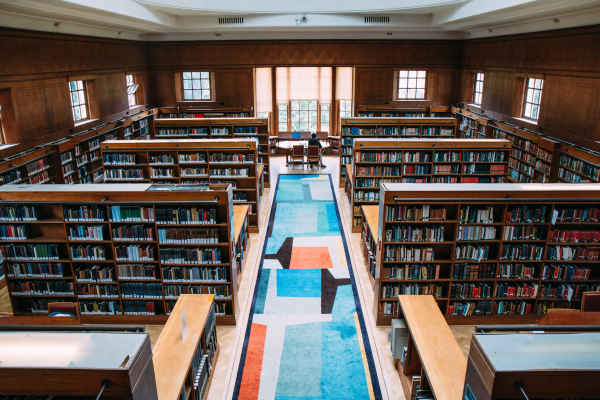 The University’s Bodleian Library (itself spread over multiple sites) is one of six Legal Deposit Libraries in the United Kingdom and the Republic of Ireland; these libraries receive a copy of every UK publication, which means that students at Oxford have access to a huge amount of material. We even have one of the Bodleian Libraries in our College’s grounds, which is unusual. 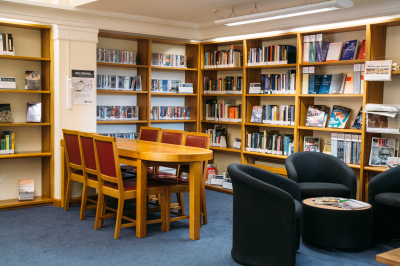 Each college library is a little different, and here are the main things to know about the library at St Hugh’s. The library is open 24 hours a day, 7 days a week. This may seem a little daunting, but this is to ensure that you can work at whatever time is best for you - we understand that for some that may be 2am! Next up - the college bar. It's run for students, which mean that discounts keep the price of a pint down. 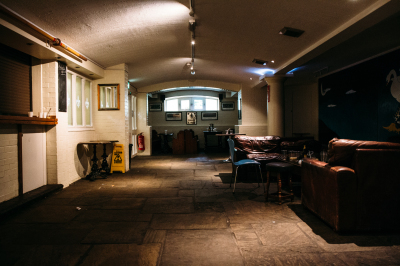 The bar is known to some as the cave. This is due to being underground and a little dark, but we love it nontheless. For those interested in pricing, you can get a pint for of lager £1.80 or a cider for £2. So as you can tell, this is pretty good value for the South (and that comes from a Northerner). The bar hosts many events over the course of a year. This includes open mic nights, comedy nights with the Oxford Imps, bops and hustings for various elections. Another thing to know about the bar is that there is a games room. 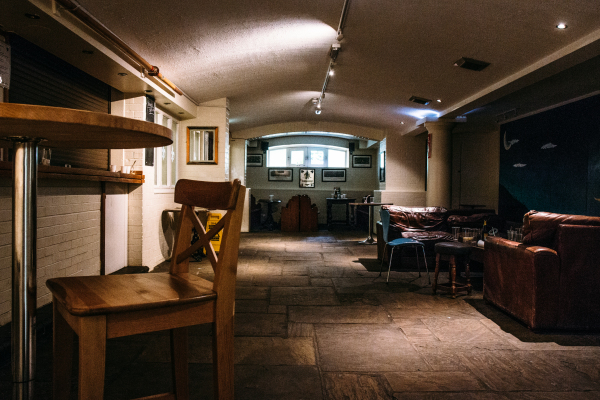 Here you can find dart boards, pool tables and a table football game. The main bar also has a number of table tennis tables in it. The gym is one of the hidden gems at St Hugh's. 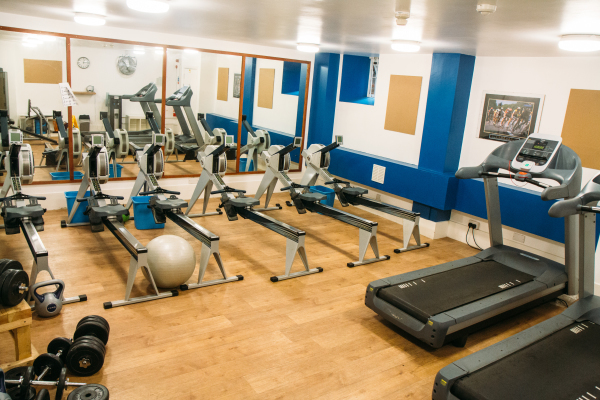 It consists of three rooms with various pieces of gym equipment. Featured here is the room with cardio equipment in it. 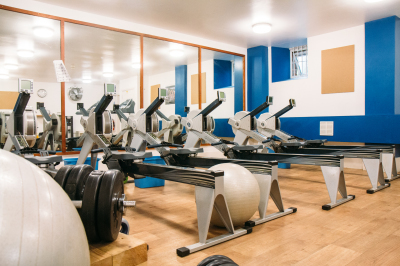 The best bit about the college gym is that is costs just £30 a term, or around £60 a year (if you want to commit to the gym life). That means excercise on the cheap for your entire degree. For those wanting more advanced facilities, St Hugh's also has a deal with Ferry Leisure Centre. Here you get a swimming pool and fitness classes alongside a modern gym for the price of £50 a term. For information on Ferry, click here.